Helped by low interest rates making investment more attractive, but availability of funds a bigger problem than the cost of borrowing. 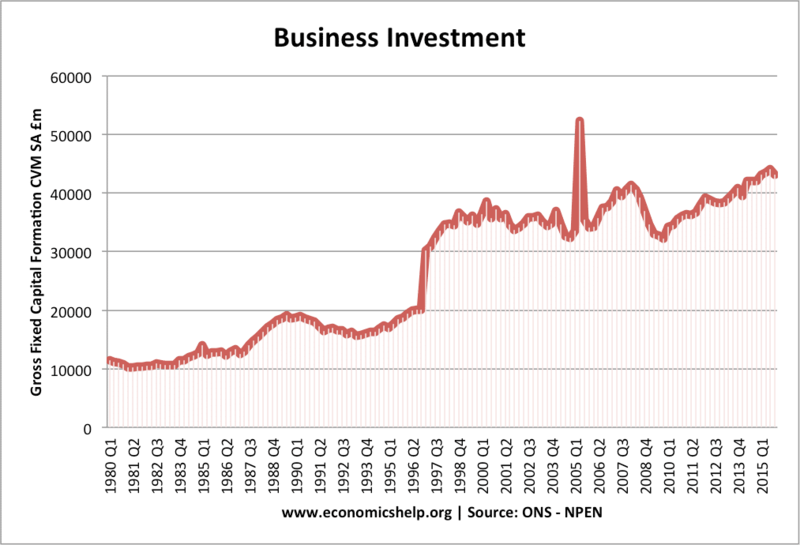 Business investment has fallen behind past trend growth in value of business investment. Despite low interest rates, banks are maintaining strict lending criteria and rationing finance. Many small and medium sized firms still state finance is difficult to come by. Prospects for economic recovery are poor. The Bank of England’s latest inflation report painted a gloomy picture of an economy struggling to post positive economic growth. Uncertainties over Britain’s place in Europe. Euro-zone debt crisis and EU recession also weigh heavily on UK investment decisions. Future of interest rates. Will interest rates rise to increase the cost of borrowing. I (investment) accounts for around 16% of total domestic demand. A rise in investment can help to promote higher Aggregate Demand. In a depressed economy, increased investment can also trigger a positive multiplier effect. With investment creating knock on effects to related industries. Net investment will increase the productive capacity of the economy and enable higher long run economic growth. If investment is efficient, it can increase the productive capacity of the economy. Without necessary investment, the economy is more likely to experience supply constraints, and it will lead to a lower long run trend rate of economic growth. It depends on other components of AD. With Consumer spending and exports weak, a boost in I could have a significant impact on increasing AD. It depends on the quality of investment. If banks are stricter with lending requirements, firms may have to focus on projects which offer best return – but equally, good projects may not occur simply because of market failure in credit markets. 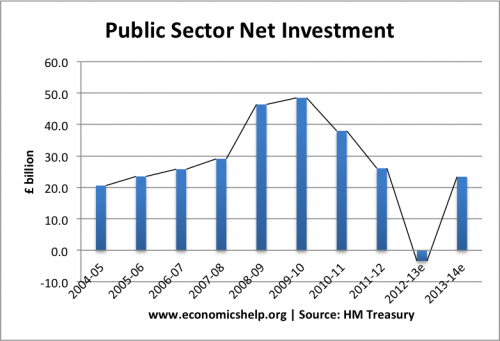 Both business and public sector investment is important. Business investment is main driver of private sector expansion. But, business also need public sector investment to finance infrastructure improvements such as transport. This entry was posted in economics and tagged investment, stats. Bookmark the permalink. ← Does the UK need a fiscal rule? 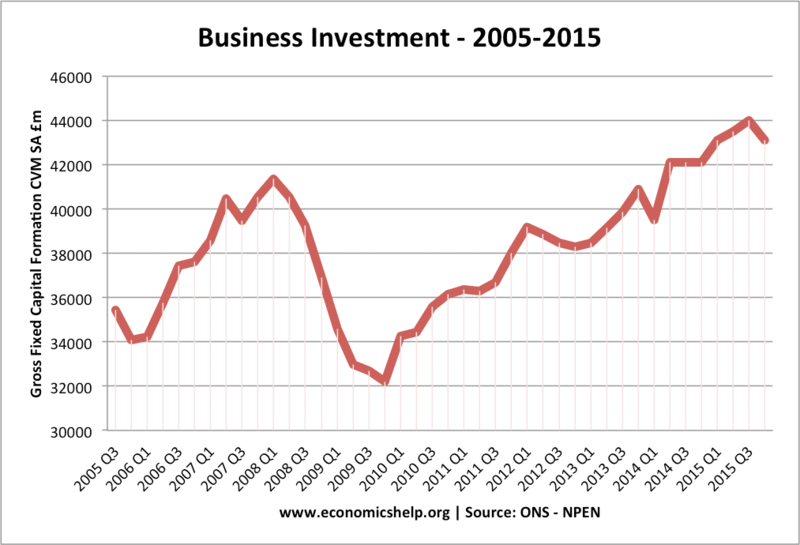 Do you have an analysis of domestic Vs foreign industrial investment in the UK?